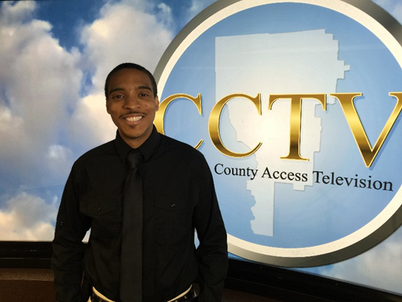 Denard Anderson, a Design & Media Production Technology major at Georgia Piedmont Technical College, brought his production expertise to Clayton County as part of the 2016 Summer Georgia County Internship Program. While Anderson had no prior experience in media operations, he was eager to learn and transfer his education into real world experience. As a media intern, Anderson’s main responsibilities involved editing video projects to help promote Clayton County. During his internship, Anderson experienced just how hard county governments work to inform and engage citizens on county matters. Aside from editing video projects, which was his main duty, he also assisted in setting up lighting and equipment for the studio. Anderson noted that his most significant success was editing the "Sip & Sounds" Concert Series. This project required many various editing procedures and helped him to rapidly develop applied editing skill. When asked about the most impactful part of his internship, Anderson replied that he enjoyed the effort required in editing video footage and watching the finished production, as well as the applied knowledge he gained in video editing and media production. He felt that the experience as a whole was very positive and enabled him to gain real world knowledge in a field he wishes to work in professionally. As far as future career plans, Anderson said he would absolutely consider a career in county government.